Leonard Nimoy, Mr. Spock On 'Star Trek,' Dies At 83 : The Two-Way The cause was end-stage chronic obstructive pulmonary disease, his granddaughter tells NPR. Leonard Nimoy as Mr. Spock from the film Star Trek: The Motion Picture, 1979. The space shuttle is shown in the background after its unveiling in Palmdale, Calif., in September 1976. In the foreground is the crew of the television series Star Trek, whose ship was also named Enterprise. 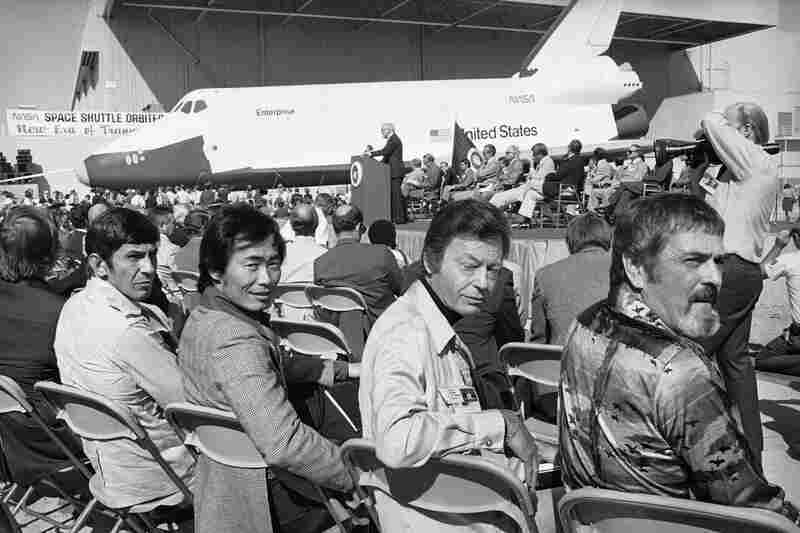 They are Leonard Nimoy (from left), who portrayed Mr. Spock; George Takei, who played Mr. Sulu; DeForest Kelley, who played Dr. McCoy; and James Doohan, who played Scotty. 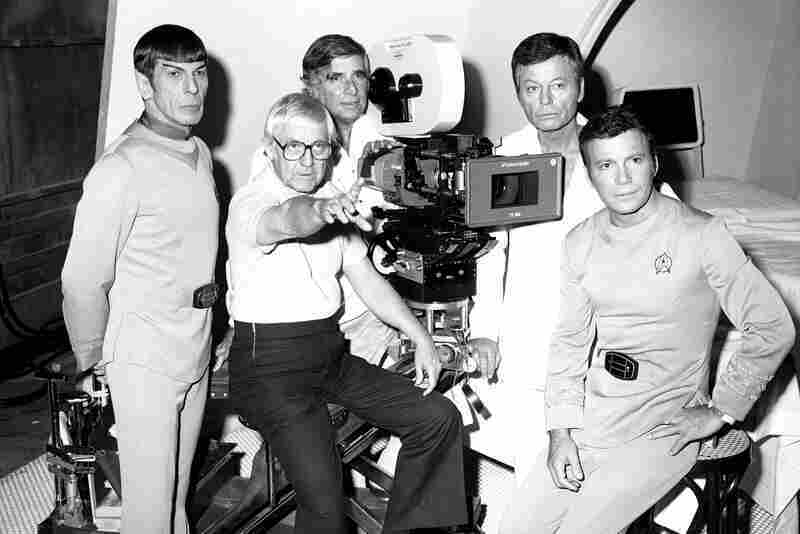 The movie Star Trek in production in Hollywood in 1978, involving members of the original television series team: from left, Leonard Nimoy, director Robert Wise, producer Gene Roddenberry, Deforest Kelley and William Shatner. 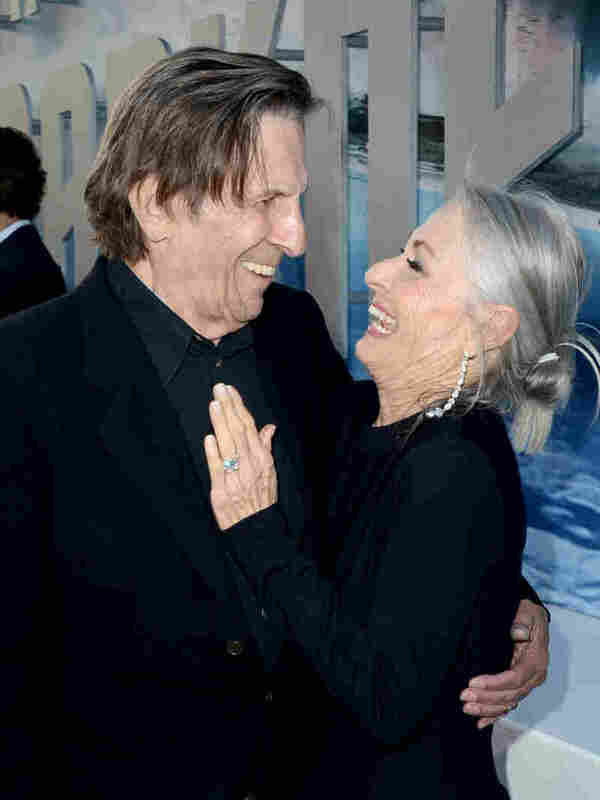 Leonard Nimoy and wife Susan Bay Nimoy arrive at the premiere of Paramount Pictures' Star Trek Into Darkness in Hollywood, Calif., in 2013. 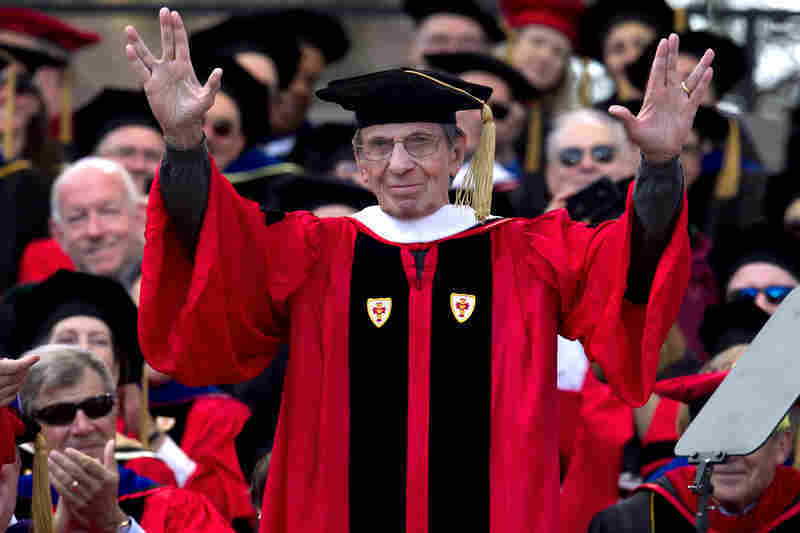 Actor Leonard Nimoy gives a "live long and prosper" sign after being awarded an honorary doctor of humane letters degree during Boston University's commencement exercises in 2012. The gesture was made popular by Nimoy's character Spock in the TV science fiction series Star Trek. 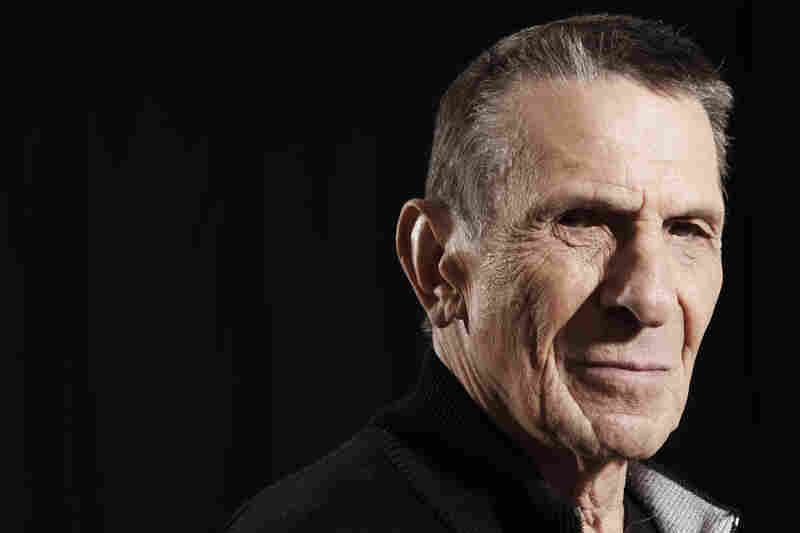 Actor Leonard Nimoy, best known for his role as Mr. Spock, the logical half-Vulcan, half-human in the original Star Trek series and several movies, has died at his home in Los Angeles, his granddaughter, Madeleine, told NPR. Nimoy was 83. The cause was end-stage chronic obstructive pulmonary disease, she said. 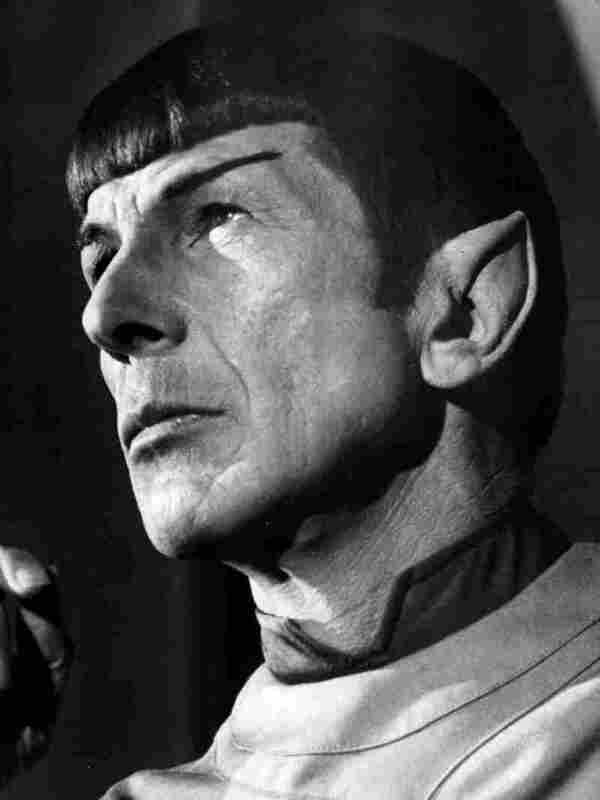 "Leonard Nimoy started acting as a teenager at a settlement house theater in Boston where he grew up. His father was a barber, a Jewish refugee from Ukraine. Nimoy felt stifled by Spock at times during his career. He also appeared on Broadway, wrote poetry and plays and directed a few blockbuster movies, including Star Trek 4. He eventually made peace with the character. Spock could have been just pointy ears and punch lines. Leonard Nimoy gave him gravitas." Nimoy reprised the role he is most famous for in the J.J. Abrams' reboot of the franchise. He told NPR's Guy Raz in 2009: "I know why they wanted me in this last film, which was to create a bridge between the original cast and the new. But that's been done. So I would suspect that there's no need for my presence again." Actor Zachary Quinto, who took over as Mr. Spock in the reboot and its sequel, told NPR in 2013 that Nimoy "was very supportive from the beginning, and we became incredibly good friends."